I am not sure why but I hardly ever wear blue. For some reason, I am just not drawn to it which is why I am quite surprised at myself for picking out this navy fedora hat as well as these blue floral pants. Oh how I love a good hat, one that holds up to its shape and one of good quality that will last a long time. This grande navy fedora by Mu Du London is the perfect example. I suppose I chose navy because you rarely see a navy/blue hat, it is often black or brown or something less unique. As for the rest of my outfit, I am wearing a white knit top from H&M last year that has the most awesome statement fluttered sleeves (I have been seeing statement sleeves popping up everywhere lately), lovely floral pants, lavender satchel, and my white patent loafers with gold chain accent. Once in a blue moon, I should wear blue. Grande navy fedora hat c/o Mu Du London. White knit top with fluttered sleeves from H&M. Floral pants c/o Dress Venus. Lavender satchel c/o Dress Venus. 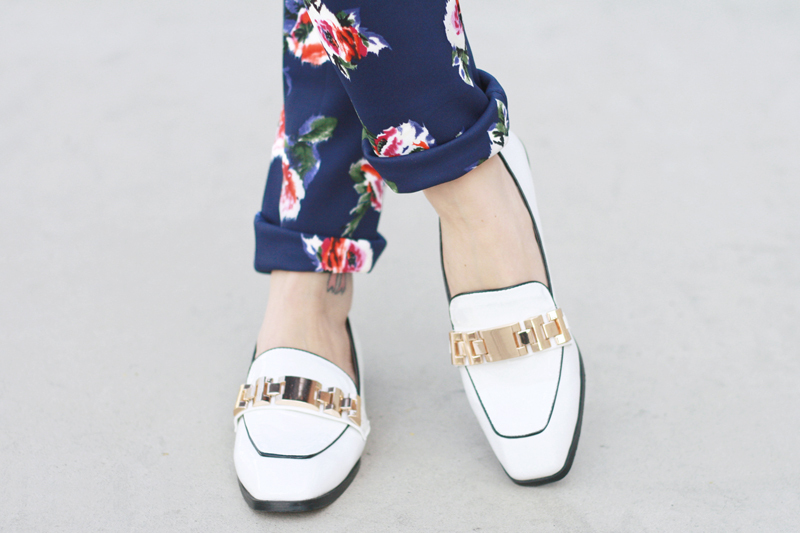 White patent loafers with chain accent by Bumper from GoJane. I'm so fond of this look ! I love this entire look! Well done! Stunning outfit! Blue looks amazing on you, you should wear it more often! Might just have to invest in those pants myself. I really like wearing blue. I think it looks nice with my red hair and it looks wonderful on you. Navy blue is a great neutral that's not really a neutral color. I love these trousers and how cute they look with your white flats. Those pants are so amazing - the print is perfect and the sweater is just lovely paired with it.